How to calculate the value of scrap Gold. 1 troy oz of Gold = 31.1035 grams. Current "Spot Price" of Gold ($1507 a troy oz) divided by 31.1035 grams = $48.451138 a gram. Multiply the Kt mark by 4.16 to calculate the percentage of gold in a given item. Example: 5 grams of 14kt gold. 5 x .5824 = 2.912 grams of Gold. Here's an example with 44 grams of 1/20 12kt Gold-fill. 1/20 of the overall weight is 12kt gold. 44 gm divided by 20 = 2.2 grams of 12kt gold. 12kt x 4.16 = 49.92% Gold. 2.2 gm x .4992 = 1.09824 gm Gold. 1.09824 gm Gold x $48.451138 = $53.210977 worth of Gold in this batch of scrap. I can set up a 3-way phone call with clients and my ore market contact. So if you've found an ore of something, send me a message or give me a phone call. and he is interested in working with me for everyone that I can refer to him. and what testing procedure was used to come up with the results given. A 10kg sample of ore is requested along with a copy of the assay report. as well as contacts that are interested in Sulfide Ores, and Loaded Carbon. I also have a contact that will refine your gold, and deduct a small portion for his efforts, and send you payment in refined bullion, or sell your portion to his contacts for 90% of Spot, and provide you with a cash settlement. "Abandoned Mining Lands in Nevada Reopening With New Claims". Well it's about that time of year, the Gold Bug is beginning to bite those of us with an interest in mining, and with Gold at around $1400 an oz combined with the down economy and lack of employment, there is beginning to be a lot more interest in mining, as is showcased by the new series on the Discovery Channel with the crew from Sandy, OR. who went to Alaska to try their hand at placer mining. but those deposits are worked heavily because of the abundance of weekend prospectors. I prefer to prospect for deposits of load gold myself due to that fact. as was the case with the person who allowed me to use the photos below. He has been out of work for 8 months, and decided to go check out an old mine in hopes that he might find an overlooked vein, and found far more than he could have ever imagined. The ore is a 'High Grade" Copper Ore with inclusions of "Plumbjarosite", which is a Lead-Silver Sulfide Ore.
For those who do not know, most old abandoned mines did not stop production due to being mined out. give the gold they owned to the US Government, and that anyone who refused, and kept their gold after the return period would be guilty of a Felony. This order also mandated that all Gold Mining cease. WW1 and WW2 had a large impact on mining as well due to the draft, and the fact that many of those who were drafted died in combat. Many of the owners and operators of those old mines who were drafted never made it back alive, and therefore those mines remained inactive, and eventually were classed as abandoned. Those facts present an opportunity for today's prospector. for how long though is seriously in question with our economy the way it is. I have read several posts in various forums pertaining to Gold and Silver where people have speculated that our Government may well once again mandate a recall on all gold in private possession. Entering old mines can be dangerous, and in some cases can be hazardous, so use cation if you choose to go explore any of them, but if you use some common sense and caution, you may well be rewarded with an astonishing discovery as is the case with the person who took the photos posted below. so if you are a buyer, go to my home page and send me a message through my contact form. In closing, I hope that this post has been informative, entertaining, and of use to all who read it. By reading the landscape it is possible to locate enriched areas of economic minerals. Which is the process of magmatic gasses mixing with the water present within the melt to create acidic solutions that dissolve all metallic, and nonmetallic minerals at depth, and redeposit them close to the surface by precipitating out from solution as the pressure and temperature decreases. Oxides form toward the end of the cooling cycle, and sulfides form early while water is still present. Indicator minerals to look for will be those that have a melting point + or - 500F of the melting point of gold, if hunting gold, or of platinum, if you are hunting Pt. Stream drainage patterns are directly related to the underlying rock of any given region, and reflect the type of geologic activity that took place there in the distant past. I will focus on one. That pattern is the "Dendritic Stream/River Drainage Pattern". 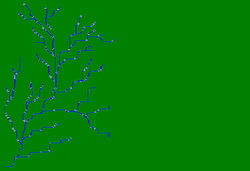 The drawing bellow is of a Dendritic Stream Drainage Pattern. These river drainage patterns are associated with compression created by foliation in the mountain building process, as is the case with the Cascade and Rocky Mountain Ranges. These ranges were created by Uplift, and Compression as the Continental Plate slid over the Oceanic Plate. This process generates great heat at depth which melts all material Subducted as it gets close to the Upper Mantle. This Crustal Material is a wet material full of water. This water is converted to steam, which then combines with the gasses within the melt to create various acids that dissolve all minerals within the melting Crustal Material, and the overlying rock as it makes its way to the surface, which redeposits its mineral load as it makes its way upward as stated earlier. This Meteoric Water is also necessary for the magma to differentiate into the various Rock Types, Which are the Host Rock(S) for the various minerals, some of which are magmatic, forming within the melt itself, while others form from Hydrothermal solutions Created by the presence of water within the melt. I will focus on those minerals created by Hydrothermal solutions. These minerals are often associated with Granitic Rocks, and differentiation products thereof, because the intruding magma supplies the heat, and the water necessary for overlying enriched deposits to have formed. These "Granitic Rocks" are often associated with "Dendritic Stream Drainage Patterns", and therefore can be found simply by looking at a "Topographic Map" of the area that you intend to prospect. Pick areas with a Dendritic Drainage Pattern, and you will be in the correct zone to find Economically Feasible Deposits of Metallic, and Non-Metallic Minerals. Metallic Ores produce various Colors as they oxidize, and therefore stain the Host Rock(s) that contain them. These stains are called Gossans. The following is a list of the various Gossan Colors. Yellows, Browns, Maroons, and Reds = ... Various Iron Oxides. Black = ................................................. Manganese Oxides. Greens and Blues = ............................... Copper Sulfides, Oxides, Carbonates, Etc. Waxy Green = ....................................... Native Silver, or Silver Chloride. The following is a list of Rock Types, and Metal Associations. Granite = ............................... Gold and Silver. Olivine Gabbro = ..................... Platinum, Chromium, Nickel, Cobalt and Iron. Dunite = ................................. Platinum and Chromium. Peridotite/Peridotite Dunite = ... Nickel, Chromite, and Platinum. The Following is a list of Gemstone, and Rock Type Associations. Almandine = .......... Diorite, Hornfels, and Schist. Andradite = ........... Granite Pegmatites, Carbonates, Hornfels, and Skarn. Pyrope = ............... Peridote Dunite, and Gabbro. Spessartine = ........ Granite Pegmatites, and Blue Schist. Uvarovite = ............ Serpentinite, and Peridote Dunite. Corundum = .......... Syenite, Nepheline Syenite Pegmatite, Hornfels, and Gneiss. Beryl = ................. Granite Pegmatites, and Schist. Tourmaline = ......... Granite Pegmatites, and Schist. Spinel = ................ Hornfels, Marble, and Gabbro. Topaz = ................ Granite pegmatites. Zircon = ................ Granite Pegmatites, Diorite, Nepheline Syenite, and Carbonatite. The following is a list of Precious metal Ores, and their Chemical Formulas. Dendritic Drainage Pattern areas are also the areas to prospect for Placer Deposits of Native Gold, and Platinum. Not just Hard Rock Ores. For simplicity, I will refer to Gold only, but the same rules apply to prospecting for Placer Deposits of Platinum. The ores containing Native Gold erode due to weathering, and as the encasing rock breaks down, it produces Elluvial Placer Deposits (Bench Placer). These deposits form on the slopes of hillsides where a depression or wide level spot occurs down-slope of the eroding In Situ (In Place) Hard Rock Deposit from which the gold is eroding from. Gold that works its way down slope to an area that is wide and flat produces an area known as an Alluvial Placer. Dessert Areas are places where this type of deposit can be found, as well as areas that are predominantly Dry, whether hot or cold. They are most common in mild temperate areas with moderate rainfall that washes the gold down slope concentrating it in wide shallow depressions that fill with sediment washed into it by Runoff Water created by rainstorms. The Gold-Fields of Ca. are a prime example of these two types of deposits. From this point, whether or not Elluvial Deposits, and/or Alluvial Deposits form, if a Hard Rock source of Gold exists up-slope, the Gold is washed into Watersheds (Runoff Water Drainage Systems), where it forms Stream or River Placers. The following is an explanation on how to work these deposits. Concentrate on those on the inside of a bend in a river. Bends at an angle of 45 - 75 degrees are the most productive. Of these types of bends, the ones flowing over bedrock, or over compacted clay, or clay and gravel Conglomerate are the best types of underlying ground for holding, and concentrating particles & nuggets of Gold, Silver, Platinum, and native Copper. Look for Quartz, Agates, and other silicate minerals, as well as Tire weights, fishing sinkers, nails, wire, Buckshot, etc. mixed in with the black sand within these bends. They are prime indicators that conditions are correct for precious metals to have been concentrated there. Sluice, pan, or dredge from the surface down in these areas. If you wish to dig, then do so, but make sure that you work all gravel from about 14 inches above the "Hard-Pan" (Rock or Clay soil River or stream bottom). Dig out Whirl Holes (Pot Holes) in the Bedrock Bottoms of Stream Beds. Pan, Sluice, or Dredge the material out of these depressions. This material will often contain fine gold, and nuggets, if Coarse Gold can be found in the region being prospected. Cracks, and Crevices are a good place to look for Gold as well. Dig, Break Open, Scratch or Scrape out the sediment from these, and pan it. Cracks, and Crevices Parallel to the flow of water are the best to look in, as they seem to catch more Gold than Cracks, and Crevices that cross the flow of water. I have never found any that cross the flow of water at an angle, but would like to. The down stream 1/3 of a crevice like that would contain concentrated values that fell into it, then agitated along the bottom of the Crack, or Crevice until it reached the downstream end, and lodged there. Rootwadds from Grass, and other Vegetation growing on Bedrock is also prime material to Break Apart, then Pan, Or Sluice. are good places to Pan, Sluice, or Dredge as well. In these areas, keep a lookout for stretches of ground that have an abundance of tumbled somewhat round rocks above the current water flow. These areas are places where water once flowed, and are now exposed chunks of ancient river channel. This material can be screened, then Panned, Sluiced, High-banked, or Dry-washed. You will be left with an abundance of Black Sand and mostly fine Gold, unless you are really lucky, (and some people are). The best method that I know of for recovering your Gold from the Black Sand would be to put your sand into a Rock Tumbler, or a modified concrete mixer with steel balls and a small amount of mercury. Turn the unit on, and let it operate until all the sand has been crushed flour fine to recover all the visible fine gold, as well as any encapsulated gold bound up in solid solution with the black sand into the mercury. Once the sand has been crushed flour fine, carefully pour off the water. The remaining sand can be ran through a "Blue Bowl", "Spiral Concentrator", such as a "Gold Wheel", or carefully panned in order to recover your mercury. Place a piece of cotton, or filter paper inside a 500cc or larger syringe, then carefully pour your mercury into the syringe, then replace the plunger and depress it, forcing the free mercury out through the tip into a container. The "Gold Amalgam" will be left inside the syringe against the cotton, or filter paper. Carefully Remove the cotton or filter paper with the gold, and place it into a Pyrex dish, and cover with a solution of one part nitric acid, and 4 parts water. Place the dish on a hot plate from an electric coffee maker, and let gently heat up. The remaining mercury will go into solution, and the gold will remain. Place a coffee filter in a plastic funnel, and then place the funnel into a glass dish in order to support it , and act as a reservoir for the solution containing the mercury. Pour the solution from the dish with the gold into the funnel, and let filter. Rinse the dish with some extra water to make sure that all the gold has been removed from the dish, and is now into the filter. Spritz the filter and gold with clean water to remove any remaining nitric solution containing mercury, and let drip, as well as sit until dry. Once dry, The filter and gold can be melted with Borax to produce a single mass of gold. Place a piece of copper plate into the nitric solution, and let sit overnight. The mercury will drop out of solution as free mercury within the solution, with some adhering to the copper plate, which can be scraped off, and the solution filtered to recover the rest. Would anyone be interested in my skills as a consultant? but lack the skills or equipment needed in order to process what they have found. who has contacts with industries that will buy various Ores, Metallic and Non-Metallic. From what I understood from the conversation that I had with him on the phone, the shipping is paid by the buyer, so that there is no out of pocket expense for the seller, (aside from that of mining, and getting it to the shipping yard). If there is an interest, I am willing to negotiate terms, and help interested clients get in touch with this contact.